Today’s business environment continues to move to the cloud and the associated cloud applications which entail a monthly subscription fee. Included in this trend is the continuing evolution of products and services with an increase in vendors and providers using a bundled approach that adds increased applications. What happens in this situation is that often product and service names feed off each other. In the case of Microsoft 365 it is basically an extension and an increased bundle offering on the base line product of Office 365. I already thought I was using Microsoft 365? Because the names are so similar and the fact that Office 365 is included in Microsoft 365, it is easy to see why businesses may think they have Microsoft 365 when in fact they only have Office 365. Office 365 is a cloud-based suite of productivity tools including Outlook, Word, Excel, PowerPoint and other applications based on whether you have purchased the Essentials, Business or Enterprise packages. Microsoft 365 is Office 365 plus Windows 10 Enterprise, Enterprise mobility and Security. Microsoft 365 includes a simplified device deployment and user set up console. How is Microsoft 365 paid for? Both Microsoft 365 and Office are paid for by a monthly subscription fee. The fee payable depends on the number of users and the package level purchased. If you are not certain which package you should buy, it is recommended that you seek assistance from your local Computer Troubleshooter who can, when talking to you, assess your needs and be able to determine which package you need to meet your specific circumstances. Why Microsoft 365 over Office 365? The key difference is that Microsoft 365 delivers an integrated platform that incorporates the office 365 productivity applications with the security of Windows 10. No more managing separate licences and ensuring all your hardware has the latest versions. Microsoft 365 has been built with small business in mind and the subscription-based model is very cost effective. A business owner can focus on their business while having the peace of mind that their data is protected, employees can collaborate, and communicate effectively anywhere on any device. This enables the business to grow without technology roadblocks. If you are already using all the separate pieces then switching is an easy yes as it will be more cost effective, less time consuming and less expensive to manage. Enhanced productivity of your team. By implementing Microsoft 365 they can more effectively collaborate with each other. Users can work on a variety of devices and they can be anywhere when working. The inclusion of Skype for Business can also mean you can still have meetings no matter where people are. This delivers enormous cost savings to a business in both physical costs and in minimising the down time of employees through travel. What is the best way to implement a switch? Nothing is as simple as flicking a switch, all products and services have a variety of setup, and implementation requirements. It is highly recommended that to ensure the quickest and most effective change over that you look at working with an established Microsoft partner such as your local Computer Troubleshooter who backs their work with a 100% guarantee. It is highly recommended that you look at incorporating ongoing support from your local Computer Troubleshooter through one of the many support plans provided. Remember that with continual issues around security you need to ensure that all your policies related to passwords, user access and email access are current and being proactively looked after. 50% of the global workforce will no longer be linked to a physical desk by 2020. Employees will work from various places and require the ability to communicate, collaborate and access vital information from a range of devices with maximum security. 59% of employees expect that their employers will provide them with the state of the art technology and tools of the trade when looking to move to a new role. Small to medium Businesses can lead the way by ensuring they are providing their employees with tools such as Microsoft 365 or Office 365. 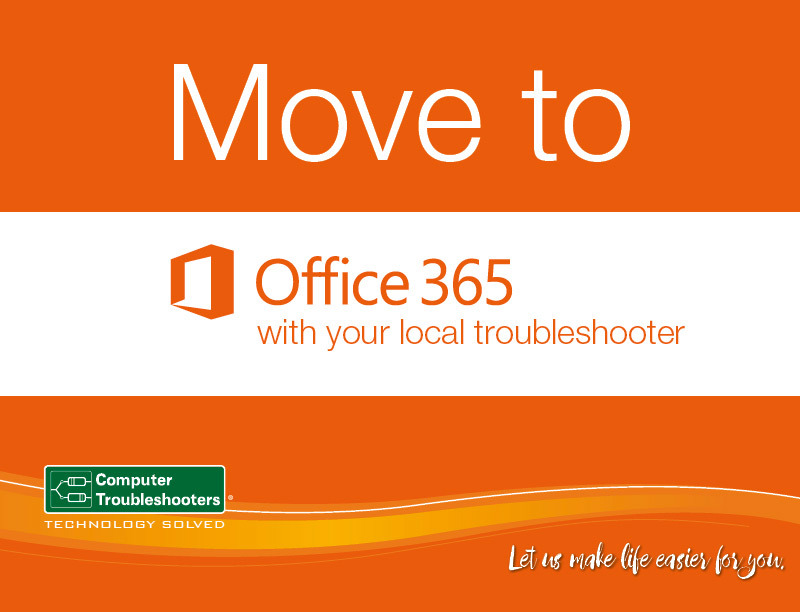 To make certain you are taking advantage of these local technologies call your local Computer Troubleshooter on 1300 28 28 78 for a chat about your challenges and needs.